Robert Nisbet Bain (1854–1909) was “a British historian and linguist who worked for the British Museum”, and “most prolific translator into English from Hungarian in the nineteenth century”, according to Wikipedia, the universal repository of knowledge about all knowable things, and even quibusdam aliis, as the saying goes. In 1896 he published a most delightful translation of several Turkish fairy and folk tales, which had been collected by the Hungarian folklorist Ignácz Kúnos. To the Turkish tales “snatched from the burning” by Kúnos, Nisbet Bain appended “four semi-Turkish tales” from Petre Ispirescu’s Legends or the Tales of the Romanians: namely the tale of Emperor Aleodor, the tale of the Enchanted Hog, the tale of Prâslea the Strong and the Golden Apples, and that metaphysical gem of Romanian fairy tales, Youth without Age and Life without Death. Nisbet Bain recommends warmly Ispirescu’s book to the lovers of folklore, as “curious and original, abounding as it does in extraordinarily bizarre and beautiful variants of the best-known fairy tales, a very natural result of the peculiar combination in Roumanian of such heterogeneous elements as Romance, Slavonic, Magyar, and Turkish”. The magnificent Internet Archive has a digitized copy of the 1901 edition of Nisbet Bain’s Turkish Fairy Tales, with splendid illustrations by Celia Levetus (1874–1936). From this edition I reproduce the tale of Emperor Aleodor, curiously retitled by Nisbet Bain as “The Story of the Half-Man-Riding-on-the-Worse-Half-of-a-Lame-Horse”. Aleodor se știa vinovat. Deși fără voia lui, dară știa că a făcut un păcat de a călcat pe moșia slutului. Mai știa iară că de omul dracului, să dai și să scapi. Să n-ai nici în clin, nici în mânecă cu dânsul. Făgădui în cele din urmă să-i facă slujba cu care-l însărcina. Aleodor would very much have liked to have got out of the difficulty some other way, as affairs of State would not allow him to take so long a journey, a journey on which he could find no guide to direct him; but what did the monster know of all that? Aleodor felt that if he would avoid the shame of being thought a robber and a trampler on the rights of others, he must indeed find the daughter of the Green Emperor. Besides, he wanted to escape with a whole skin if he could; so at last he promised that he would do the service required of him. Nisbet Bain translates Făt-Frumos as Boy-Beautiful: it’s a well-found, reasonable translation. English-speaking readers will probably want to know how to pronounce the name of the protagonist; in Romanian it’s /ale.o'dor/. I’d say that the best English approximation is to pronounce it Aleodore, with -eodore as in Theodore. 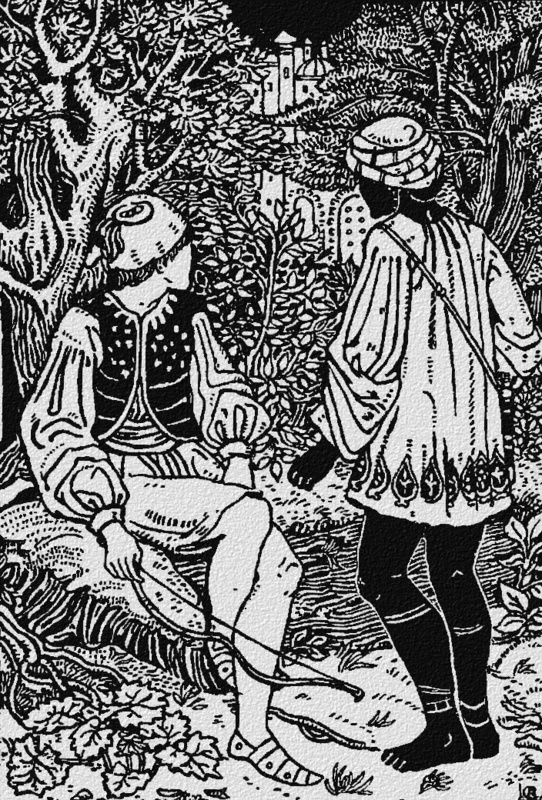 These being said, without any further delay I present the tale of Emperor Aleodor by Petre Ispirescu, retold in English by Robert Nisbet Bain. Once upon a time, long long ago, in the days when poplars bore pears and rushes violets, when bears could switch themselves with their tails like cows, and wolves and lambs kissed and cuddled each other, there lived an Emperor whose hair was already white, and who yet had never a son to bless himself with. The poor Emperor would have given anything to have had a little son of his own like other men, but all his wishes were in vain. At last, when he was quite an old old man, Fortune took pity on him also, and a darling of a boy was born to him, the like of which the world had never seen before. The Emperor gave him the name of Aleodor, and gathered east and west, north and south, together to rejoice in his joy at the child’s christening. The revels lasted three days and three nights, and all the guests who made merry there with the Emperor could think of nothing else for the rest of their lives. He had no sooner said these words than his throat rattled thrice, and he gave up the ghost. He departed to his place like every other human soul that is born into the world, though there was never Emperor like him since the world began. Those of his household bewailed him, his great nobles bewailed him, his people bewailed him also, and then they had to bury him. Aleodor, from the moment that he ascended the throne of his father, ruled the land wisely like a mature statesman, though in age he was but a child. All the world delighted in his sway, and men thanked Heaven for allowing them to live in the days of such a prince. All the time that was not taken up by affairs of State, Aleodor spent in the chase. But he always bore in mind the precepts of his father, and took care not to exceed the bounds which had been set him. One day, however—how it came about I know not—but anyhow he fell into a brown study, and never noticed that he had overstepped the domains of the Half-man till, after taking a dozen steps or so onwards, he found himself face to face with the monster. That he was trespassing on the grounds of this stunted and terrible creature did not trouble him over-much, it was the thought that he had transgressed the dying command of his dear father that grieved him. Aleodor would very much have liked to have got out of the difficulty some other way, as affairs of State would not allow him to take so long a journey, a journey on which he could find no guide to direct him; but what did the monster know of all that? Aleodor felt that if he would avoid the shame of being thought a robber and a trampler on the rights of others, he must indeed find the daughter of the Green Emperor. Besides, he wanted to escape with a whole skin if he could; so at last he promised that he would do the service required of him. ¹ Fet frumosŭ, the favourite name for all young heroes in Roumanian fairy-tales. Then the youth went on further and marvelled greatly at such a strange encounter. When Aleodor heard these words, and how the ant called him by his name, he raised his foot again and let the ant go where it would. He also went on his way, and after journeying for I know not how many days he came at last to the palace of the Green Emperor. There he knocked at the door, and stood waiting for some one to come out and ask him what he wanted. The servants of the Green Emperor looked up, and they looked down, but they had not one word to say for themselves. At last they went and called Aleodor and led him before the Emperor. So they made them a compact, and the deeds were drawn out and signed and sealed. And immediately striking Aleodor with his tail, he turned him into a little shell-fish, and hid him among the other little shell-fish at the bottom of the sea. When the damsel appeared, she put on her eye-glass and looked for him in every direction, but could see him nowhere. Her other wooers had hidden themselves in caves, or behind houses, or under haycocks and haystacks, or in some hole or corner, but Aleodor hid himself in such a way that the damsel began to fear that she would be vanquished. Then it occurred to her to turn her eye-glass towards the sea, and she saw him beneath a heap of mussels. But you must know that her eye-glass was a magic eye-glass. This he couldn’t deny, so of course he had to come up again. “We shall see,” replied the Emperor. “Let us try!” and with that it struck him with its wing and turned him into a young crow, and placed him in the midst of a flock of crows that were flying high in the air in the teeth of a fierce tempest. So the ant turned him into a flower-seed, and hid him in the very skirts of the damsel without her perceiving it. Then when he heard her say that he had conquered, he slipped slowly down from her skirts and revealed himself. The Emperor had now nothing more to say, so he gave the youth his daughter, and when they departed, he escorted them to the boundaries of his empire with great pomp and ceremony. While they were on the road they stopped at a place to rest, and after they had refreshed themselves somewhat with food, he laid his head in her lap and fell asleep. The daughter of the Emperor could not forbear from looking at him, and her eyes filled with tears as they feasted on his comeliness and beauty. Then her heart grew soft within her, and she could not help kissing him. But Aleodor, when he awoke, gave her a buffet with the palm of his hand that awoke the echoes. Then they set out again till they came alive and well to the Half-man-riding-on-the-worse-half-of-a-lame-horse. Then the half-monster half-man was near to melting for the love he had for the damsel, and, writhing away on his belly, he fetched his mother that she might help to persuade the maid to be his wife. But meanwhile the damsel had dug a little trench all round her, and stood rooted to the spot with her eyes fixed on the ground. The hideous Satanic skeleton of a monster could not get at her. Still he strove and strove to get at her, but finding at last he could not reach her, he burst with rage and fury that a mere woman should have so covered him with shame and reproach. Then Aleodor added the domain of the Half-man-riding-on-the-worse-half-of-a-lame-horse to his own possessions, took the daughter of the Green Emperor to wife, and returned to his own empire. And when his people saw him coming back in the company of a smiling spouse as beautiful as the stars of heaven, they welcomed him with great joy, and, mounting once more his imperial throne, he ruled his people in peace and plenty till the day of his death. And now I’ll mount my horse again, and say an “Our Father” before I go.